Rather peaceful fish. Only during breeding times he is aggressive. You should keep them in a large, high aquarium that is not planted very densely. You should set up the aquarium with some pieces of driftwood and some roots. He needs a large territory, and he barely digs in the substrate. You should give them live and frozen food. They do not like dry food. Breeding is not difficult with a goof matching couple. The male is very particular in choosing his partner. Up to 1000 eggs are laid and fertilized on stones. Both parents care for the fry. As soon as the parents want to spawn again, the young fishes should be removed. 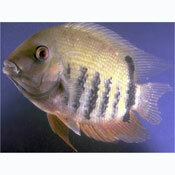 New World Cichlids such as the Firemouth, Green Terror, Salvini, Texas and Blood Parrot. Also Plecos. Good filtration and regular water changes are a must.